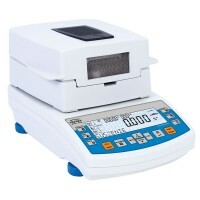 Moisture analyzers are essential laboratory equipments that aid with determination of the moisture content of a sample. 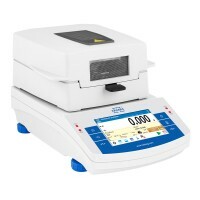 These devices are comprised of a weighing system and a drying system, that are designed to work together to calculate the moisture balance in the provided sample. The basic principle involved is the measurement of the originally wet sample and analysis against the reading after drying the sample. A heating element concealed within the product will ensure efficient heating of the sample to remove moisture from it after the initial measurement is observed. Suitable for the food, chemical, pharmaceutical and plastic industries, these devices have efficient drying systems to provide final results in minimum time. Moisture Analyzers, MA 50/1.X2.AFeatures:MA X2 moisture analyzers are hi-tech measuring instruments ..
Moisture Analyzers, MA 110.RFeaturesMoisture analyzer is a laboratory measuring instrument intended ..
Moisture Analyzers, MA 110.X2.AFeatures:MA X2 moisture analyzers are hi-tech measuring instruments i..
Moisture Analyzers, MA 210.RFeaturesMoisture analyzer is a laboratory measuring instrument intended ..
Moisture Analyzers, MA 210.X2.AFeatures:MA X2 moisture analyzers are hi-tech measuring instruments i..
Moisture Analyzers, MA 50.RFeaturesMoisture analyzer is a laboratory measuring instrument intended t..
Moisture Analyzers, MA 50.X2.AFeatures:MA X2 moisture analyzers are hi-tech measuring instruments in..
Moisture Analyzers, MA 50/1.RFeaturesMoisture analyzer is a laboratory measuring instrument intended..